According to Metrolist, Colorado’s largest MLS, September housing numbers for the Denver metro and surrounding area continued to show signs of a slowing market, as autumn set in. With 8,959 active listings on the market, inventory of available homes in September dipped seven percent as compared to last month. The number of new listings that came on the market was down 14 percent month over month. However, there was a six percent increase over this time last year. With regard to average sales price, September brought a slight decrease for the second consecutive month. The average sold price for a single family home in September was $319,819, down three percent from last month. Home prices remain strong, up five percent year over year. As is typical, with the onset of autumn, September also brought a downtick in the pace of home sales. Month over month, the sale of new homes was down 14 percent and there was a three percent decrease year over year. The days on market measurement remained stable, but low during the month. Homes stayed on the market an average of 30 days, a two-day increase as compared to last month, and 10 days fewer than September 2013. The market absorption rate indicated a steady level of demand for properties. 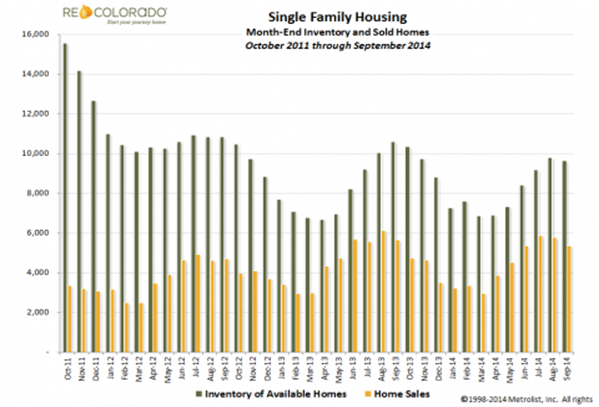 There was a supply of just eight weeks of inventory at September month end. “September numbers showed customary seasonal cooling following Labor Day,” said Kirby Slunaker, President and CEO of Metrolist. “Despite low inventory, we had a strong selling season, particularly in the condo and townhome market. The Denver area condo and townhouse market had an active selling season. Year to date, 13,994 new condo and townhouse listings have come on the market, a 26 percent increase as compared to 2013. Showing a similar trend, the number of sold listings is up 27 percent year over year. Signs point to continued strength in this market, as demand for townhomes and condos remained strong. Year to date, average sold price is up 13 percent over 2013 and the number of days a condo or townhome property stayed on the market was at 29 as compared to 47 last year.